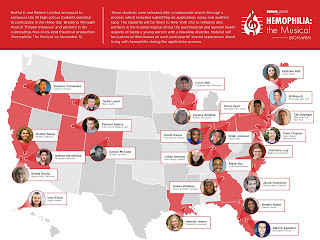 BioMarin Pharmaceutical Inc. (NASDAQ: BMRN) today announced the debut of the Broadway-style "Hemophilia: The Musical," a first-of-its-kind theatrical production featuring 25 students affected by a bleeding disorder. A recording of the six-song performance is now available at BreakingThroughHemophilia.com. 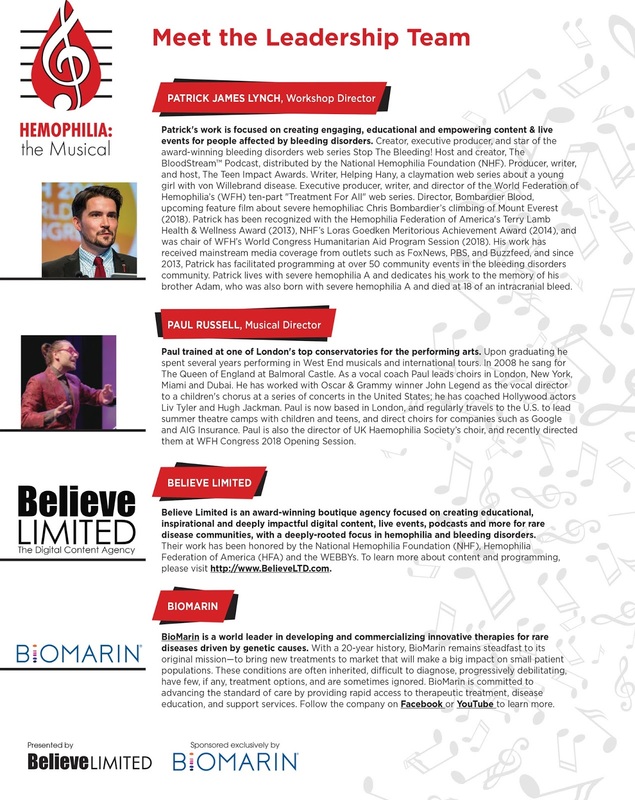 "'Hemophilia: The Musical' was a defining moment for many of the young adults who participated," Patrick James Lynch, Believe Limited CEO and Breaking Through! Musical Theater Intensive director, said. 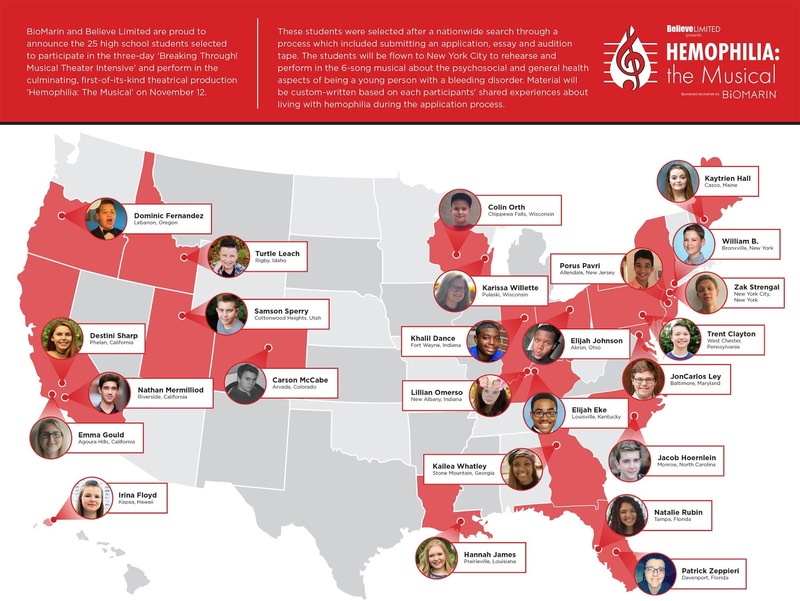 "Together, these 25 teens stood on stage and sang about real and relatable experiences for young people who live with bleeding disorders. Through music, they were able to share what their lives are like with a broader audience and connect with each other and others in their community in a unique way." Today's musical performance followed the story of high school students who are working through the challenges of being perceived as "different" due to their medical conditions. As the musical unfolds, the young adults are shaped by events in their lives and learn how to embrace who they are and follow their dreams, while living with a bleeding disorder. The moral of the story is summed up with a quote by one of the performers, who said, "Although having an illness limits you, there are one million things you can do for every one thing you cannot." 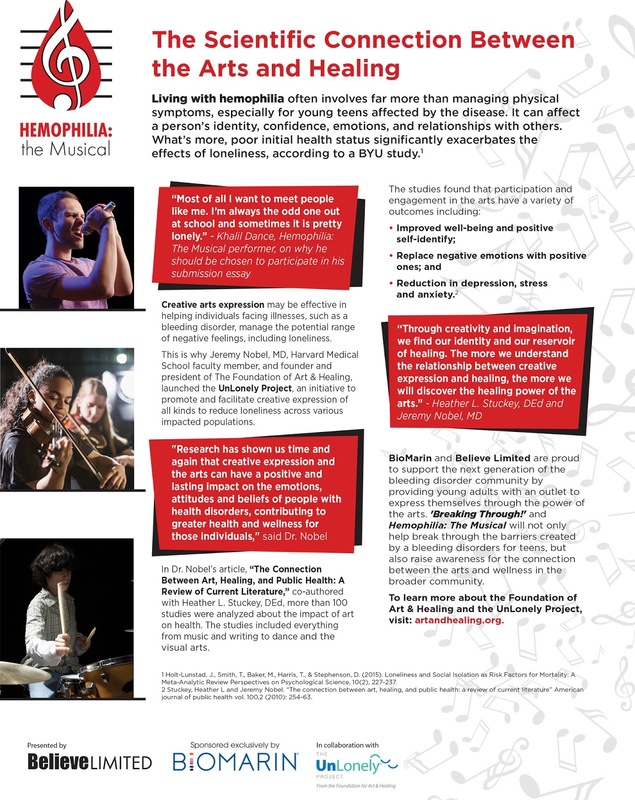 As a program collaborator, The Foundation for Art & Healing will assess the impact of "Hemophilia: The Musical" and the Breaking Through! Musical Theater Intensive on participants. The assessment will measure the impact of the experience on each student and determine whether participating in the program helped the students feel more confident and connected with one another and better prepared to manage their condition. The results will be used to further validate the value of programs like "Hemophilia: The Musical" and the Breaking Through! Musical Theater Intensive, and will be made available publically to underscore the importance of creative expression and the arts for people living with chronic disease. "There is an important connection between creative expression and wellness for people living with chronic conditions, like hemophilia, which can be particularly isolating," Jeremy Nobel, M.D., Harvard Medical School faculty member, and founder and president of The Foundation of Art & Healing's UnLonely Project, said. "BioMarin's sponsorship of this program and our research will enable us to contribute to the already extensive body of data that supports the value of creative expression and the arts in improving health and wellbeing." In preparation for the performance, the students participated in the three-day Breaking Through! Musical Theater Intensive workshop that included coaching sessions on the impact of breathing and relaxation on pain management, as well as the psychosocial benefits and therapeutic value of self-expression in the arts. The musical theater intensive and performance were produced in partnership with the Los Angeles-based Believe Limited to help empower the bleeding disorder community through the power of music, performance and the arts and both were exclusively sponsored by BioMarin. "'Hemophilia: The Musical' is an excellent example of what can be accomplished when meaningful creative outlets are provided for young people with bleeding disorders who often have to seek alternative avenues for self-expression and group participation," Hank Fuchs, M.D., President of Worldwide Research and Development at BioMarin, said. "Being part of this pioneering effort is consistent with who we are as a company and our focus on improving the quality of life for people living with rare disease." 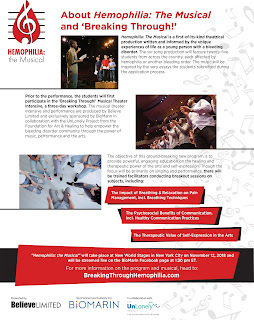 For more information about "Hemophilia: The Musical" and the Breaking Through! Musical Theater Intensive program, visit BreakingThroughHemophilia.com. Hemophilia A, also called factor VIII (FVIII) deficiency or classic hemophilia, is a genetic disorder caused by missing or defective factor VIII, a clotting protein. Although it is passed down from parents to children, about 1/3 of cases are caused by a spontaneous mutation, a new mutation that was not inherited. Approximately 1 in 10,000 people is born with Hemophilia A. People living with the disease are not able to form blood clots efficiently and are at risk for excessive bleeding from modest injuries, potentially endangering their lives. People with severe hemophilia often bleed spontaneously into their muscles or joints. The standard of care for the 43 percent of individuals with hemophilia A who are severely affected is a prophylactic regimen of Factor VIII infusions two to three times per week. Even with prophylactic regimens, many people still experience spontaneous bleeding events that result in progressive and debilitating joint damage. 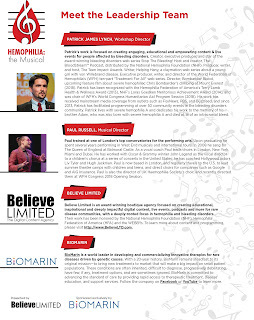 Believe Limited is an award-winning boutique agency focused on creating educational, inspirational and deeply impactful digital content, live events, podcasts and more for rare disease communities, with a deeply-rooted focus in hemophilia and bleeding disorders. Our work has been honored by the National Hemophilia Foundation (NHF), Hemophilia Federation of America (HFA) and the WEBBYs. To learn more about our content and programming, please visit BelieveLTD.com. BioMarin is a global biotechnology company that develops and commercializes innovative therapies for people with serious and life-threatening rare disorders. The company's portfolio consists of seven commercialized products and multiple clinical and pre-clinical product candidates. BioMarin is researching a gene therapy candidate for Hemophilia A in multiple ongoing clinical trials. For additional information, please visit BMRN.com. Information on BioMarin's website is not incorporated by reference into this press release.